PHOENIX, May 20, 2014—A controversial gun-safety ad campaign is about to return to Phoenix, after the city lost its attempt to censor the project sponsored by a gun-safety training group, TrainMeAZ, LLC (www.trainmeaz.com). The Goldwater Institute’s Scharf-Norton Center for Constitutional Litigation, which represented Alan Korwin and TrainMeAZ, LLC, was granted summary judgment for its client earlier this month by the Arizona Court of Appeals, preventing Phoenix from blocking the ads. Phoenix had forced them down a mere nine days after they were posted under contract more than three years ago. 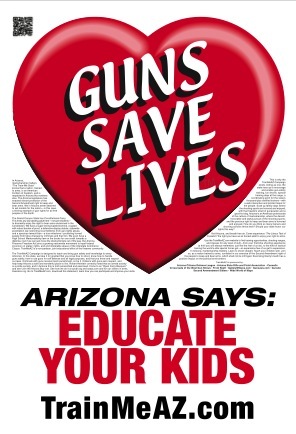 The ads, which were placed inside city bus shelters, feature a large red heart with the words “Guns Save Lives” and the line “Educate Your Kids,” with contact information for TrainMeAZ.com. City officials at the time told Alan Korwin, owner of TrainMeAZ, that the message was too controversial and had garnered a complaint, and so had to be removed or changed. In court, the case revolved around the city’s changing standards and the ad’s accompanying small text, designed to motivate bus riders to go to the website and sign up for real firearms-safety training. Details of the case, including a timeline of events leading up to the censorship, all the court papers, the text of the ad, and photos of the ads on city streets, are available at www.trainmeaz.com under the “newsroom” button. “We are enormously gratified that the Arizona Court of Appeals protected the First Amendment rights of all Arizonans by striking down the City of Phoenix’s arbitrary decision to forbid ‘Guns Save Lives’ advertisements at City bus stops,” said Clink Bolick, lead attorney for The Goldwater Institute. This entry was posted in Journalism News and tagged ads, advertisement, court ruling, gun safety, lawsuit, Phoenix, TrainMeAz by Valley of the Sun SPJ. Bookmark the permalink.